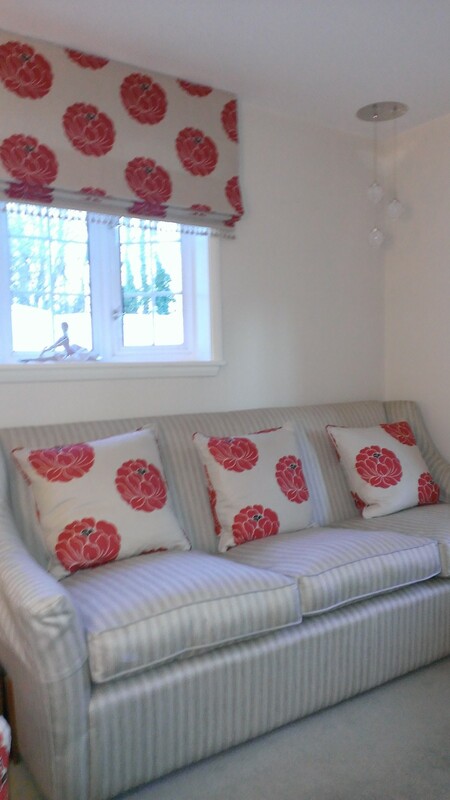 Bromley Curtains and Blinds » Roman Blinds and bespoke sofas and chairs, Chelsfield village. 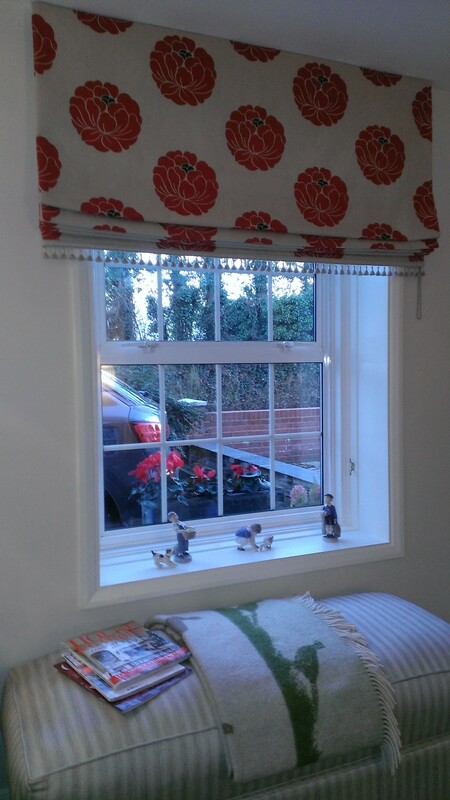 This week was a busy week for Bromley Curtains and Blinds, with several curtain and blind measures, curtain and blind fits and lots of cushion deliveries.. On Monday, we fitted some beautiful Roman blinds in the sitting room of a cottage in Chelsfield. Using Romo – Miraflores fabric in the Rowan colourway, the finishing touch was a pretty tassel braid from Osborne and Little. 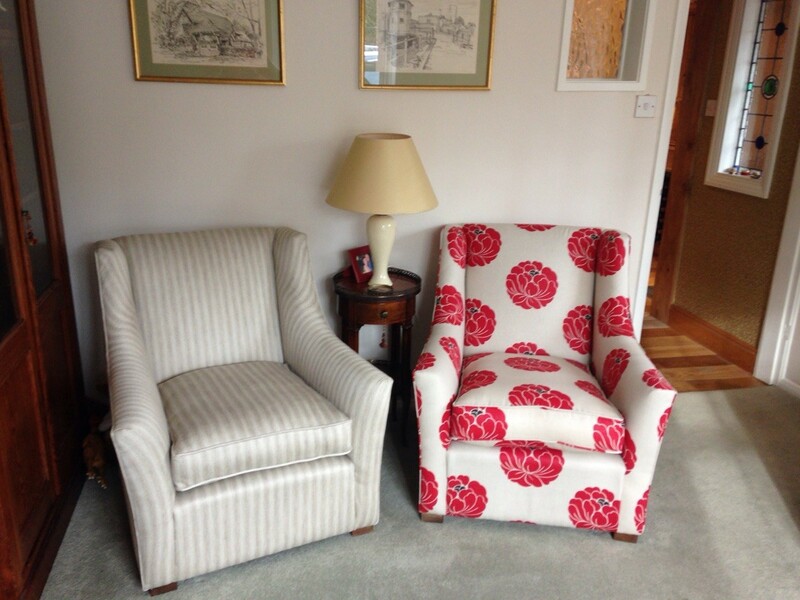 On the same day we delivered a bespoke sofa (which Steve, our super talented upholsterer made to fit the space exactly), an ottoman in the same fabric, which can be used as extra seating and storage and finally two armchairs and some cushions. Along with fresh new paint from Farrow and Ball in ‘Dimity’ the period cottage was given a stylish and contemporary new look. The ‘Saturday Morning Kitchen’ table arrived in time for Christmas, and we made two dining chairs in Chase Erwin ultra suede to match the existing chairs. 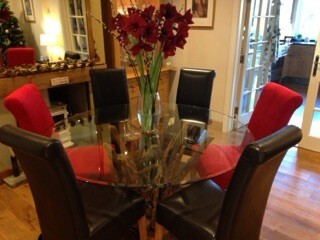 The clients were so pleased with the result that they have decided to have more chairs made to match. We think our upholsterer and frame maker did a fantastic job. Ultra suede is a great fabric to use for dining chairs, it comes in a rainbow of colours and is very stain resistant and easy to clean.